Schools have emptied and the hot weather is here. This time of year is very popular for vacations. With the way of the current economy however, not every person has the financial resources to take the trip away that they need. Everybody deserves a break in order to re-charge from daily life. Perhaps some of these ideas will strike a chord and give people an idea for their time off that will allow them to save some money. Imagine going on a wonderful vacation without dealing with packing, unpacking, being bodily searched, being squeezed into a sardine can for six hours with nothing but granola bar and a man next to you who is definitely not Sure, or eight-hour car rides and the effervescent smell of an exploded babyâ€™s diaper in the back of the car. Most people donâ€™t even realize they can relax and have all of the standard vacation/tourist experiences they need not far from their actual homes. 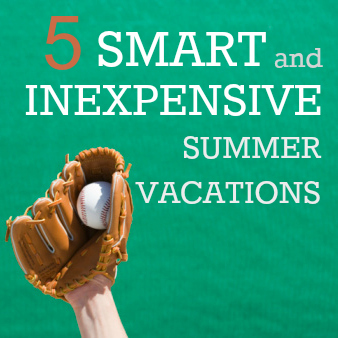 Remember, you can also lower your vacation costs by planning ahead. 1. Please Donâ€™t Feed the Bears . . .
No matter where you live, there are local, state and national parks somewhere in your area. For the lovers of outdoors, many of these parks offer camping accommodations. This is a very cost efficient way to get out of the house. (For first-time campers or those with children, you may want to try a night in your back yard first.) While there, you can enjoy the lake, beach, river etc. with a little fishing, boating or swimming. There is nothing better than the smell of breakfast cooking as you walk through a campground, or that first Sâ€™more of the evening. 2. Who Are the People in Your Neighborhood? Why go sightseeÂ some place you canâ€™t even pronounce when there is so much right around your corner? From historic sites to theme parks, art galleries to random sites of curiosity, you can provide your family with a great time without having to take a second mortgage on the house. If your vacation is family-oriented, one of the least expensive options is taking the family to the local public swimming pool. Many of these have become water parks with all sorts of activities for the kids. Thereâ€™s fun to be had for the whole family at this inexpensive, safe family-oriented facility. What if you donâ€™t have kids? What if your way of kicking back is with a dirty martini and some charred meat? Do a search for local breweries, vineyards, wine bars and other great restaurants you have been thinking of trying. Local carnivals and festivals are great ways to have fun, eat different foods and experience something out of the ordinary. Many are celebrated for a short period of time with special concerts or fireworks attached. It could be a balloon festival where you get to see the sky filled with color, or an oyster festival that features taste-testing contests. The kids will have a blast and you will find yourself smiling in no time. With 30 professional baseball teams, not every corner of the country is able to take in a game. When you add the various â€œminor leagueâ€ teams and facilities, it opens up a lot more options. Support your local teams and go see them play. You will experience the sights and sounds of Americaâ€™s pastime and maybe even see a future star. Hopefully at least one of these ideas will jump out at you. There are ways to show the entire family a good time and get out of the house without wiping out your bank account. Try these, youâ€™ll like it. Be safe and have a great summer. What are some other smart, inexpensive vacations you can take? Leave a comment!